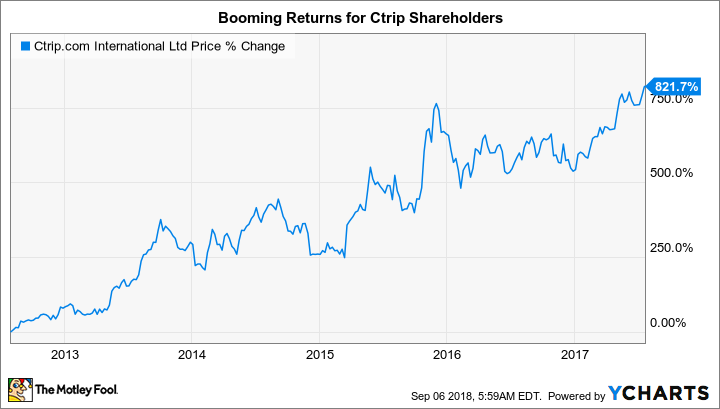 After Years of Booming Growth, Is Ctrip.com Plateauing? The situation has changed in China. Coming out of the Great Recession, there was a brutal battle for market share among China's online travel agencies (OTAs). That led to pricing wars that significantly cut into profitability. The bleeding, however, came to a stop when the major players consolidated under Ctrip.com International's (NASDAQ:CTRP) umbrella. What followed was a sight to behold: revenue gains that routinely topped 75% combined with improved margins. The stock surged over 800% between July 2012 and July 2017. Since then, however, Ctrip has run into trouble. Not only is the Chinese market starting to become saturated, but the government has cracked down on the company's practice of automatically opting customers in to high-margin options -- which it dubs "value-added services" -- like expensive travel insurance. It doesn't help, either, that such practices seem to be in direct opposition to Ctrip's stated "customer-centric" approach. All of this sets the table for where Ctrip.com was positioned heading into this week's quarterly earnings release. Ctrip's second-quarter earnings offered investors a mixed bag. Before we dive into the details, here's what the headline numbers looked like. Data source: Ctrip. EPS [earnings per share] presented on non-GAAP basis. Investors always like it when earnings grow faster than revenue. And on a GAAP basis, earnings actually jumped 600% thanks to a one-two punch of lower stock-based compensation and huge gains in the fair value of Ctrip's investments. That said, it wasn't all roses. The sales jump was at the low end of management's guidance, and gross margin actually contracted by 265 basis points to 79.9%. Investors should keep an eye on margin, as much of the slippage can be blamed on the change in the approach to value-added services. If it continues downward -- after having lapped the one-year anniversary of the change -- there might be more serious problems to consider. But this decline in gross margin was made up for by improvements in operating expenses. As you can see below, the company was able to grow revenue 13% while only needing a 6% bump in sales and marketing expenses -- a sign that the company's brand carries weight in China. Data source: Ctrip. Figures back out stock-based compensation. Much of the company's strength for the quarter came from accommodation (i.e., hotel) sales, while the transportation unit showed meager growth thanks to the aforementioned value-added services change. On the company's conference call with analysts, founder and Chairman James Liang made it clear that investments in customer experience -- and avoiding high-margin sales that might alienate customers over the long run -- would continue. "We will continue to make investments in improving customer satisfaction as we believe this strategy will create more customer lifetime value over the long run," he said. On that note, Liang noted that Ctrip's net promoter score -- a measure of how well the brand resonates with customers -- improved 20% over the past year. A count of nearly 7,000 offline, Ctrip-branded stores across 200 Chinese cities. These stores brought in a cumulative $10 million in sales in a single mid-August day last month. The stores are also crucial in lower-tier cities for bringing new internet users into the Ctrip ecosystem. International travel and accommodations -- excluding meta-search travel site Skyscanner -- both increased volume by nearly 40%. Skyscanner's direct booking platform achieved 600% growth for the quarter, while overall revenue was up 30%. Management believes that revenue will grow between 13% and 18% during the third quarter. On the conference call, analysts asked whether investors should be worried about a slowdown in China's economy, and how that might effect Ctrip. Liang stated: "In the long run, I'm still very optimistic about the Chinese economy because if you look at the per capita income, China is still only a fraction of the developed countries." He went on to address a salient point: Chinese citizens are consuming fewer things and opting instead for access to services -- similar to the sharing economy we see in the United States. While this might affect the manufacturing sector of the economy, Ctrip would be somewhat insulated, as traveling is an experience, rather than a durable good. Investments in infrastructure like train lines and airport upgrades also make him optimistic moving forward.